CDC Denies Banning Words; Rights Group Projects Disputed Terms Onto Trump D.C. Hotel : The Two-Way "Diversity." "Transgender." "Fetus." A Washington Post report, which the Trump administration denies, says that CDC scientists were told not to use those and other words in budgetary documents. The Human Rights Campaign, an LGBTQ civil rights organization, projected seven words that were allegedly banned from some CDC documents onto the facade of the Trump International Hotel in Washington, D.C., on Tuesday. The Human Rights Campaign, working with artist Robin Bell, projected words like "fetus" and "transgender" onto the Trump International Hotel in Washington, D.C., on Tuesday night, to protest the words being included on a "forbidden" list circulating at the Centers for Disease Control and Prevention. A Washington Post report says staff were instructed not to use the words in budgetary documents. The Department of Health and Human Services, which includes the CDC, has denied the report, calling it a "complete mischaracterization" of conversations about the annual budget. The CDC says that the words are not banned and that the organization remains "committed to our public health mission as a science-and evidence-based institution." According to the Post, high-level officials at the CDC were told not to use seven words — diversity, entitlement, evidence-based, fetus, science-based, transgender and vulnerable — while writing documents connected to next year's budget. 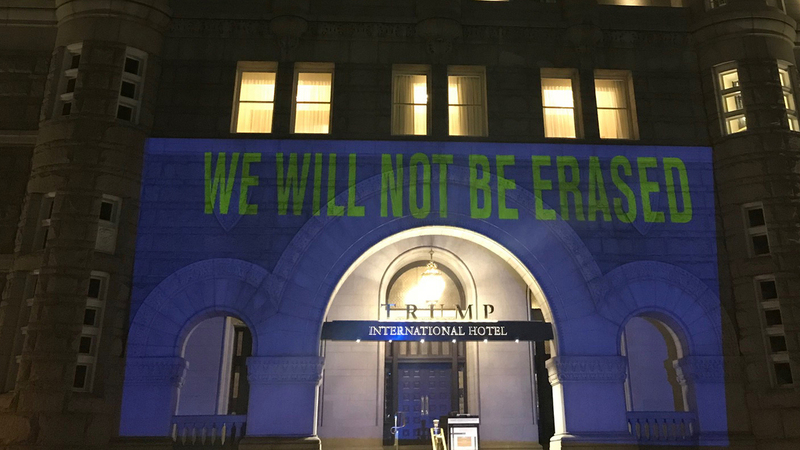 On Tuesday night, the HRC projected those seven words — along with the phrase "We will not be erased" — onto the front of the Trump International Hotel, not far from the White House. "In conjunction with the enormous light display, HRC has filed a Freedom of Information Act (FOIA) with the Department of Health and Human Services (HHS) for any and all records, including communications with the CDC, relating to the banned words from November 2016 onward." Artist Robin Bell has used projections on public buildings — including repeated ones at the Trump hotel — as a form of public protest. He previously projected "Pay Trump bribes here" on the entrance, while displaying messages like "Protect people, not polluters" on the Environmental Protection Agency headquarters, which is across the street from Trump's hotel. As NPR has reported, the hotel has become a popular site for protests, while also raising ethical concerns about President Trump's conflicts of interest. So what exactly is happening with the seven words in the projection? Pending any responses to FOIA requests, here is what we know. The Post report is based on an account from an anonymous source who was present for a 90-minute briefing about the annual budget and said "other CDC officials confirmed the existence of a list of forbidden words." The meeting was led by a career civil servant who did not explain why the words were being banned, the anonymous source told the Post. The director of the CDC, Brenda Fitzgerald, vociferously denied the characterization of the words as "banned," saying in a statement "there are no banned, prohibited or forbidden words at the CDC — period." But Fitzgerald did not deny that some staff may have been instructed to avoid certain language in key budget documents. "I understand that confusion arose from a staff-level discussion at a routine meeting about how to present CDC's budget," Fitzgerald wrote in her statement. "It was never intended as overall guidance for how we describe and conduct CDC's work." The Union of Concerned Scientists notes that even if the meeting was accurately described to the Post, "it is unclear whether the directive came from Trump administration officials or from career staff self-censoring to avoid falling into political traps." "Career staff at government agencies often modify language to stop their work from being politicized," the organization notes. "Yet there's a fine line between necessary self-preservation and needless self-censorship." Last month, NPR's Rebecca Hersher reported that scientists who study climate appear to self-censoring under the Trump administration, reducing references to "climate change" and relying more on phrases like "extreme weather." "The change in language appears to be driven in part by the Trump administration's open hostility to the topic of climate change. Earlier this year, President Trump pulled the U.S. out of the Paris climate accord, and the President's 2018 budget proposal singled out climate change research programs for elimination. "Meanwhile, the Environmental Protection Agency has been systematically removing references to climate change from its official website. Both the EPA's leader, Scott Pruitt, and Secretary of Energy Rick Perry have said they do not accept the scientific consensus that humans are causing the planet to get warmer. "As a result, many scientists find themselves in an uncomfortable position. They are caught between environmental advocates looking to recruit allies and right-wing activists who demonize researchers and denigrate their work." Meanwhile, the Post has also reported that some words are banned or discouraged at at another unnamed branch of the same department that runs the CDC. "A second HHS agency received similar guidance to avoid using 'entitlement,' 'diversity' and 'vulnerable,' according to an official who took part in a briefing earlier in the week," the Post reported Saturday. "Participants at that agency were also told to use 'Obamacare' instead of ACA, or the Affordable Care Act, and to use 'exchanges' instead of 'marketplaces' to describe the venues where people can purchase health insurance."